Publisher: Little Brown & Co., 1962. Reprint Edition, BeerBooks.com, 2007. Soft Cover, 424 pages, 6.25 x 9.5. 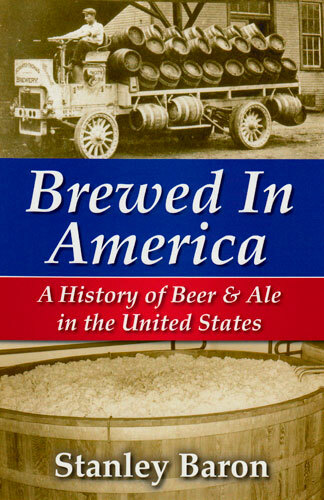 More than a half-century after its first release in 1962, Brewed In America remains the most comprehensive historical study of beer in the United States yet published. Author and historian Stanley Wade Baron traveled the country trolling countless archives and scouring well-buried resources to uncover beer's colorful American history. It was Baron who first fully illuminated the ubiquitous role that beer played in the development of the nation. To make Baron's cornerstone work more widely available to historians and beer enthusiasts, BeerBooks.com has reprinted the book, complete with all the original illustrations. A first-edition copy was digitally scanned, professionally enhanced and reproduced in a soft cover format. 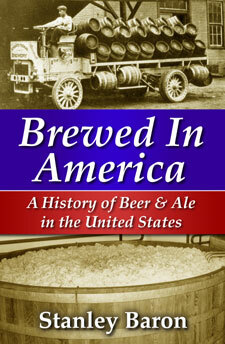 From George Washington's hand-written recipe for beer to the rise and fall of the "Noble Experiment" (National Prohibition) and beyond, Brewed In America tells the story of beer in the United States with incredible breadth, depth and insight, and sets the standard to which all subsequent beer historians have been held. YOUNG AMERICA was rich in men of genius. Among them all certainly Thomas Jefferson must rank especially high. He was not only the author of one of the most famous of all political documents: he was also an adroit politician, a philosopher, a scientist, a farmer -- in short, a man of extraordinary variety, wisdom and attainment. Like most public men of his period, Jefferson tirelessly kept voluminous records of his correspondence, his activities, his thoughts, his expenses. He had no secretaries, no typewriters -- he had to do his own painstaking writing. And in his account books and letters he composed a detailed history of his life and times, often in the most humdrum notation of the routine events of each day. Since his interests were catholic and his hand was in such a multitude of activities, he has a very special place in the story of beer in America. From all indications he was not particularly a beer-drinker; he was, for himself, more interested in wines -- as can be judged by the records he kept of the wines he ordered, and of the length of time each "pipe" [two hogsheads or four barrels] lasted. Late in life, when discussing tariff problems with W. H. Crawford, Monroe's Secretary of the Treasury, he proposed lowering the tariff on wines so that "the midling class" could buy it and thus avoid "the poison of whisky, which is destroying them by wholesale." The beer he bought during the early days of his political activity was probably for his household. The period when he bought most beer from commercial brewers was after his return from France and during the four years (1789-1793) he spent, mostly in Philadelphia, as Secretary of State in Washington's Cabinet. The likeliest explanation is that, during those years, when he lived at 274 High Street (down the road from Reuben Haines's brewery), he was entertaining more regularly than when in residence at Monticello. From a wine dealer named Farquhar, he bought one dozen bottles of porter for one pound in June of 1790, and the same amount in August. At the end of each quarter, Jefferson made an "Analysis of the expenditures of the last quarter." In the quarter from 9 April to 7 July 1791, he reckoned his brewer's bill had come to $15.00. The brewer who supplied him in 1792 and 1793 (the year of the yellow fever epidemic) was Henry Pepper [Henry Pfeiffer], who had taken over the brewery of Joseph Potts in 1791. Located originally at 2 South Fifth Street, this brewery had been inaugurated about 1774. In January 1792, Jefferson paid his bill to Pepper, which came to $39. In January 1793 the bill was only $17; but in July of that year there was an additional payment for six months' supplies at $27.67. It was in January 1794 that Jefferson resigned from the government and retired to his Virginia properties, but in 1797 he came back to Philadelphia, as Vice-President. He was no less meticulous than in the past about keeping track of his household expenses; each day he entered in his account books a record of moneys paid out, even the odd penny to a beggar. There are no entries for beer during these years, but it is possible Jefferson changed his methods and included beer among "provisions," which is the way he was inclined to think of it. On two particular days, 8 June and 22 November 1798, he recorded purchases of hops: the first time a small quantity for 53�, the second a rather larger amount for $4.15. There is no way to explain these two entries, which do not fit into any of the other patterns, except to conjecture that Jefferson's servants might have been trying to make small beer in the kitchen. During the years in Washington as President (1801-1809), Jefferson kept in close touch with his farms in Virginia. He supervised his overseers either in person, during vacation breaks, or by streams of letters: there was hardly a seed sown that he was not aware of. His interest in farming machinery, his experiments with all sorts of tools and what we now call labor-saving devices, his plans for making the best use of his land were matters which absorbed a great deal of his time. At this late-afternoon stage of his career, he was more interested in the serene rural life than the political market place, and so it was with some relief and great anticipation that he finally retired forever from serving his country, and in 1810 went back to Virginia and his busy privacy. This happened to be a time of farm depression. The war which was to start thundering in two years already hung like an ugly cloud in the sky. The exportation of wheat, on which farms like Jefferson's, devoted predominantly to grain rather than tobacco, depended for their prosperity, had fallen from about five to a little over one million bushels within ten years. Although Jefferson was constantly improvising schemes for earning greater returns from his farms in order to pay off his incessant debts, it does not seem likely that his venture into the brewing of beer was one of these -- simply because there is no evidence whatsover that he ever sold any of the beer that was made at Monticello. the London & Country brewer and Combrun's book on the same subject. We are this day beginning, under the directions of Capt Millar, the business of brewing Malt liquors, and if these books are no longer useful to you I will thank you for them, as we may perhaps be able to derive some information from them. Jefferson and Meriwether had undoubtedly discussed the feasibility of brewing before that day; in fact, there may have been some experiments earlier, because Jefferson noted in his account books that he had sent to "Capt. W. D. Meriwether for malt 2 D [dollars]" on 17 March 1812; a week later, "Capt. Meriwether for 2. more bush. of malt 2 D."; and on 15 April of that year he had paid $1.33 to Daniel Farley for hops. But the possibility of brewing in earnest depended on the fortunate coincidence of Captain Miller's being confined to Albemarle County as an alien in time of war. He was in a curious position, this Captain Joseph Miller, whose name would probably count for nothing except for his association with Jefferson. In a letter addressed to General Andrew Moore, requesting permission for Miller to go to Norfolk, Jefferson described the man's background: "His father & mother came over about 1768 to Maryland to settle there. He was born there soon after their arrival." The mother returned with her son to England and brought him up there, with the result that he was not considered a citizen of the United States. "He took to the seafaring business which he has followed all his life, except 4 years that he was engaged in a brewery in England." Miller's reason for coming to the United States was to claim a bequest left to him by a half-brother, Thomas Reed, who had died in Norfolk. Because of Jefferson's intervention, General Moore agreed to allow Miller into the Norfolk area. It seems to have been the purest of accidents which eventually led the brewing captain to Charlottesville, and there to Jefferson's attention. For years afterward, he was both an aid and a concern to Jefferson, who was diligent in trying to regularize Miller's entangled affairs. It was characteristic of Jefferson, once he had decided to start brewing, to turn to the authority of books. He was an unquenchable reader and book collector: it was his personal library, after all, which formed the nucleus of the Library of Congress. The two books he had lent to Meriwether and then in 1813 asked back were well-known works on brewing that had appeared in England during the eighteenth century. The London and Country Brewer, first published in 1742, written coyly "By a Person concerned in a PUBLICK BREWHOUSE in London," described in more than 300 pages "The Whole Art of Brewing all Sorts of Malt-liquors, As practised both in Town and Country; according to Observations made by the Author in Four Years Travels through the several Counties in England." Though this book is written from a professional point of view, inveighing against those "who, if they have but seen, or been concerned in but one Brewing, and that only one Bushel of Malt, assume the name of Brewer," it is nevertheless the epitome of the empirical method, speaking in terms of "blood-warmth" and other homely forms of measurement -- which shows that it was written before the wide use of mechanical gauges. The other book, The Theory and Practice of Brewing, published in 1762, was written by Michael Combrune, a practicing commercial brewer, who stated in the preface that his book was "the first attempt, that has been made, to reduce this art [brewing] to rules and principles." Combrune might be called a pioneer of scientific brewing, even though he was quite wrong in his "chemical" analyses. In the Aurora of Sep 7. I see a book advertised as under publication at N. York under the title of "the American brewer & Malster" which, as teaching the method of malting Indian corn I should be very glad to get. Could you procure it for me if published or when published. Dufief answered quite promptly that the book in question had not yet appeared, but he would send it as soon as it was printed. With a curious persistence, Jefferson continued to make inquiries about the book he had seen advertised. "I am anxious to receive the 'American brewer and malster' as soon as published," he wrote to Dufief on 7 November 1813. "I have both Richardson & Combrune which you mention." Several months later he came back to the same subject: "I must still request you to keep in mind my former unsatisfied commissions. The work on brewing from Indian corn, particularly, if yet published, will be acceptable." Dufief replied without delay that he would write to New York to make sure whether the book had appeared, but about ten days later he had to confess that "The American Brewer & Malster's assistant," as he referred to it, was not even at the printer's. The book did not reach the public until late in 1815; in the meantime, the author was probably busily soliciting subscribers in sufficient numbers to make publication practical. Joseph Coppinger, the writer of the book, was a man who deserves some attention in his own right. The first appearance he made on this particular scene was in 1802, when he wrote from New York directly to President Jefferson in Washington, calling himself at that time a farmer from England who had been in the United States only a few months. He expressed the great admiration which many Europeans must have felt for the American experiment; assumed that it was possible in this country, of course, to address the President directly; and ended up by asking how he could obtain a patent for an invention "for preserving animal and vegetable substances either in their naturel, or a cuit state, and this without the aid of Salt." Jefferson personally answered this letter and told Coppinger which Act of Congress applied to his request. Coppinger sent a second letter on the same subject from Pittsburgh on 3 January 1803, and then, upon receiving no reply, a follow-up on 18 February, in which he hoped that he had not given offense. to have it in my power to interest wealthy and influential characters in the request I am about to make to you. Still I am not without hopes of ultimate success in calling your attention to what I have had long and earnestly at heart, that is the establishment of a Brewing company at Washington as a National object. It has in my view the greatest importance as it would unquestionably tend to improve the quality of our Malt liquors in every point of the Union and serve to counteract the baneful influence of ardent spirits on the health and Morals of our fellow Citizens, considerations in themselves so important as to be well worthy the attention of every wise and good Statesman on the list of whom universal suffrage has given you a distinguished place. After this well-turned preamble of flattery, he went on to say that a national brewery, such as he envisaged, could be started with a capital of $20,000 -� one half to be spent for buildings and utensils, and the other to be "considered as active stock." His scheme was to raise this capital by subscriptions of $500 and $1000 shares. I hesitate not to say that under prudent and good management 100% can be securely made on the active Capital of $10,000 on all the beer & Ale & Porter which may be brewed for this Company and disposed of in the Cask. Whilst that which may be Sold in bottle will leave 200%. This I will pledge myself to prove as clearly as two and two, make four. He then drew attention to the revenue England obtained through her breweries, and finally offered his own services in this enterprise. "I have followed the brewing trade nearly twenty years. In that time built two breweries on my own Acct. formed two distinct establishments with success in both." There is appended to the message a list of Coppinger's various inventions through the years. It would be easy to see in this extraordinary document an effort by an ambitious man to advance himself in the service of the govemment. Possibly there is some element of self-enhancement in Coppinger's various communications with people in high places, but it is not absolutely unlikely that he did, in fact, wish to offer his services to a government which seemed to afford him great pleasure and expectations. The letter addressed to Madison clearly reached Jefferson's hands, for the name of Coppinger and date of receipt are methodically written on the document in Jefferson's handwriting. A second, which was also turned over to Jefferson, was dispatched by Coppinger only five days later, reiterating many of the points made the first time, but emphasizing the advantages to the health of the country offered by his scheme. "Those families who are in the custom of using Malt liquor freely as their common drink all summer keep and preserve their health while their less fortunate neighbors who are deprived of it are the victims of fever and disease." Sir, I have to acknolege the reciept of your favor of the 6th. I have no doubt, either in a moral or economical view, of the desirableness to introduce a taste for malt liquors instead of that for ardent spirits. the difficulty is in changing the public taste & habit. the business of brewing is now so much introduced in every state, that it appears to me to need no other encouragement than to increase the number of customers. I do not think it a case where a company need form itself on patriotic principles meerly, because there is a sufficiency of private capital which would embark itself in the business if there were a demand, but as to myself particularly I am too old & too fond of quiet to engage in new & distant undertakings. I am lately become a brewer for family use, having had the benefit of instruction to one of my peo ple by an English brewer of the first order. I had noted the advertise ment of your book in which the process of malting corn was promised & had engaged a bookseller to send it to me as soon as it should come out. we tried it here the last fall with perfect success, and I shall use it principally hereafter. during the revolutionary war, the brewers on James river used Indian corn almost exclusively of all other. In my family brewing I have used wheat also as we do not raise barley. I shall still desire my bookseller to send me on your book when printed. Accept the assurance of my respect and best wishes for the extension of the use of malt liquors. For some unexplained reason, Coppinger waited until 15 September to continue the correspondence; at that time he attached a printed prospectus of his "contemplated" work on brewing "which will probably be ready for delivery in three weeks from this day." He undertook to assure Jefferson of receipt of the book if he could have the name of a bookseller in Washington. The prospectus offers the table of contents of the projected book, and a short statement of its purpose, including the familiar view "that an extensive use of malt liquors is the natural, and perhaps, the only, effectual remedy to the too great consumption of ardent spirits." It is to be hoped that eventually Jefferson did receive Coppinger's book, but there is no record of his having it. As late as 1821, Jefferson was recommending Combrune's book above all others, so that if indeed he had ever read Coppinger's book it cannot have impressed him especially.